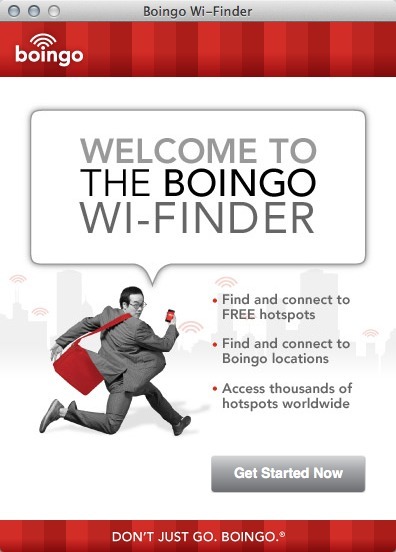 Access Boingo hotspots in hotels, airports, convention centers, etc. (was GoBoingo!). Developer website: Boingo Wireless, Inc.
Is there a better alternative to Boingo Wi-Finder? Is Boingo Wi-Finder really the best app in Internet Utilities category? Will Boingo Wi-Finder work good on macOS 10.13.4? Boingo Wi-Finder (was GoBoingo!) makes it super easy to connect to any of the more than 100,000 Boingo partnered hotspots throughout the world. Boingo powers hotspots in bookstores, cafes and coffee shops, airports, hotels, retail stores, and restaurants. They have access plans available in daily or monthly increments that provide unlimited access to all Boingo hotspots (in either North America or internationally). Boingo plans begin at $4.95 per month for unlimited access. Version 5.1.2024: Release notes were unavailable when this listing was updated. Boingo Wi-Finder needs a review. Be the first to review this app and get the discussion started! Boingo Wi-Finder needs a rating. Be the first to rate this app and get the discussion started!